"An essential, sweeping history of the American frontier, its end and what it has meant to our nation's sense of itself." "The End of the Myth aims, in part, to reposition race-based violence to the center of the frontier narrative [and] situate today's calls to fortify our borders in relation to the centuries of racial animus that preceded them... A vital corrective to popular conceptions." 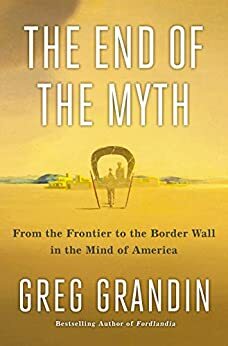 "The End of the Myth kicks hard-packed certainties into dust as Grandin strides across three centuries... to supply rich new context to familiar events and pluck neglected ones from the shadows." "One of our most gifted writers and thinkers, Greg Grandin has given us a history of the United States like none other. It is a history written from our ever-shifting and expanding borders, a history of our quest to escape history, and a history of how that history has now caught up with us. The End of the Myth bubbles with ideas, insights, and challenges (and often with wry humor), offering essential perspective on our current condition." "A great book. 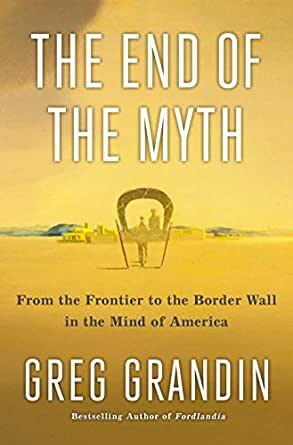 Brilliant, erudite, and above all else fresh, The End of Myth offers a genuinely new, compelling, and historically informed framework for understanding the madness of this political moment." "Many historians have recounted the legend-encrusted saga of American expansionism. Written with insight, passion, and uncompromising moral clarity, The End of the Myth renders all prior interpretations obsolete. The Age of Trump needs history that is both bold and subversive. On both counts, Greg Grandin delivers." "'If you want to avoid civil war, you must become imperialists, ' Cecil Rhodes once said. The End of the Myth trenchantly relates how an American dream of expansion and growth managed to contain domestic disaffection, and reveals the perils of a shattered imperial fantasy. Describing the consequences of an exhausted imperialism, Grandin illuminates, like few have, our treacherous present. A tremendous book." "What happens when expansion is no longer viable as a promise for the nation's future and as a fix for its problems? Greg Grandin's analysis of our current political moment is historical, erudite, provocative, and beautifully written." "A compelling examination of the American history of frontiers, by one of the most innovative and imaginative historians in any field. Troubling but inspiring, this is intellectual history for a broad readership; its sweep and force are stunning. Grandin brilliantly gives our current conditions of aggression, nostalgia, and racism deep historical grounding for the benefit of all who will listen." "This book is an extraordinarily incisive look at the myths that Americans have used to evade our real situation and the responsibilities we might have to one another as members of a democracy. It is also a rich, illuminating, and unsettling retelling of American history as the story of these evasions and the harm they have done--and the countercurrents we might still hope to draw on to build a deeper and better democracy." 5.0 out of 5 starsThis is vital reading! Grandin continues his top notch contributions to understanding the Americas with this excellent work of living history. To understand the role that the wall plays in American politics, you have to understand the frontier. From the point of contact, the American mind was created in the psychological expanses of land and the pathological attempts to clear it of its native inhabitants. The frontier created a safety valve for every displaced urge and the vitriol of the colonizers, a valve that has remained in place since. Grandin traces all of these steps and I can't do this excellent book justice in a short review, but I can say that this must be read. There is a reckoning that is long overdue in this country about the very nature of "freedom" and what that actually means. As it has been understood and enacted, it is a product of the frontier, of might makes right practices of displacement, exclusionism, and unrepentant expansionism. That is what fueled the white supremacy that underlies our contemporary reality, which is a wound time hasn't healed, but reopened. Because there has been little to no acknowledgement of the racist, colonial realities of America, in both history and in the mind, these things foment into populist distractions. The wall never needed to be built, whether it eventually is or not. It just had to represent the shift in the American mind from the end of the frontier to the constantly redefined and militarized edges of a globalized empire. I can not download this book to my Kindle. Please advise me what is wrong. I haven't read the book, tho after listening to the interview with the author on WNYC radio's On the Media program, I certainly intend to, but I did think, after listening to the adverts of that interview and the book, of how Hadrian's Wall, constructed in the 2nd C circa 125 AD, serves as a symbol which essentially marked the end of the expansion of the Roman Empire and the beginning of its lengthy constriction, how it marked a change in the mindset motivating that empire to protect what was instead of ever more expansion, and how the Trump wall fiasco is motivating the current US direction of looking inward instead of outward and onward. After all, as pointed out in the interview, Trump himself has proclaimed, "America first" which is a viewpoint, while not completely differing from anything previous, the way Trump couches its meaning, is far more limited than that which preceded, marked to my mind by our treatment of Europe post WWII. In order to benefit ourselves, we contributed largely to Europe's reconstruction to give our markets a means to benefit ourselves, and at the same time benefit the Europeans and the world. The Trump doctrine, stated in person just this week, is to withdraw aid in an attempt to force countries in duress to curtail the flight of their citizens towards the US. Thus, I think this book is uniquely timely and look forward to adding to this review. This is a carefully researched book and a brilliant analysis of the frontier and the wall in America. It should be required reading for all high school and college students. Grandin, who is a professor of history at Yale, takes the reader from the destruction of American Indians to the Trump While house without leaving anything out along the way. Its not a pretty trip, but he offers fabulous insights into how we got to where we are in 2019. A fascinating book that gave me real insights in to understanding the republican mind set.